[PDF] Encyclopedia of the World's Nations and Cultures, 2 edition: 4 Volume Set | Free eBooks Download - EBOOKEE! 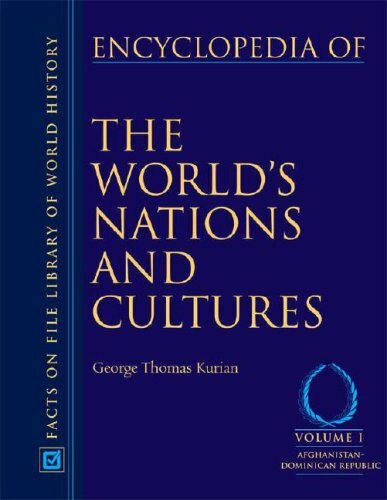 Description: "Encyclopedia of the World's Nations and Cultures" comprises an extensive overhaul of the original "Encyclopedia of the World's Nations". It provides concise and objective descriptions of the dominant political, economic, social, and cultural systems of the countries of the world. The encyclopedia features 193 country-by-country surveys in 40 separate categories, as well as tables, charts, and lists that are linked with narrative accounts of each nation's peoples, history, government, society, and culture. This edition includes articles on three additional countries and 14 new sections on culture and society with each entry. Both the text and the extensive statistical data have been fully updated. New coverage includes: East Timor Marshall Islands and The Federated States of Micronesia. New sections in each entry include: Culture Entertainment and recreation Etiquette Family life Flora and fauna Folklore and mythology Food Health A list of modern rulers Living conditions Personal appearance Science and technology Sports and Work. No comments for "[PDF] Encyclopedia of the World's Nations and Cultures, 2 edition: 4 Volume Set".